Stephen Prina, galesburg, illinois+, John Cage, Knox College, Galesburg, Illinois, April 1983, Photographer unknown. All documentation of John Cage’s visit to Knox College in February 1972— including photographic documentation and an audio recording of his talk—is missing from the Knox College Library. This photograph holds the place of the earlier event., 2015, digital C-print, fabric, wood, 27 x 23 7/8". Are you a lefty or a righty? How about your earlobes—attached or unattached? The codes that make up a genome and determine such traits are immensely complicated, but the categories these traits are sorted into can appear strangely arbitrary. After all, what is the significance of flesh (or lack thereof) connecting the head and the earlobe? 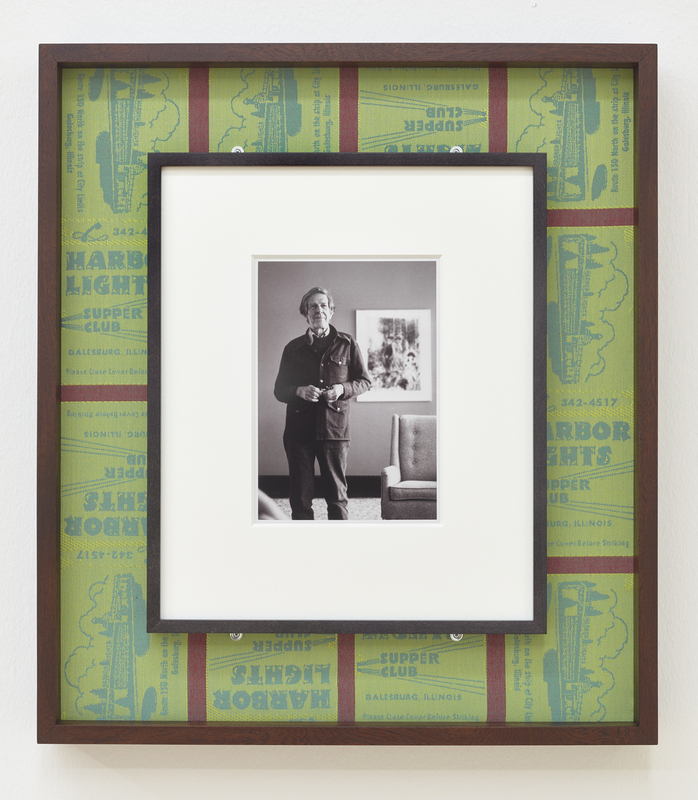 Stephen Prina’s exhibition “galesburg, illinois+,” which has been shown at various venues since 2015, links seemingly consequential and coincidental biographical details to question deterministic understandings of personal histories. Prina’s project presents the small Midwestern city of his birth via an aerial photograph (Harbor Lights Supper Club, Galesburg, Illinois, 1947–1986, former site, 2015, Photography: Foley Photo Studio, Galesburg, Illinois, 2018), artifacts (a penny acquired as change at a Galesburg drug store and a photograph from the Knox College Library in Galesburg), and two anecdotes, which appear as wall texts in the gallery. In one of these epigraphs, the artist describes an unexpected cameo by his hometown supper club in a video screened at the Kitchen in New York. In the other, Prina recounts performing in a band at the local Taco Hideout Lounge, only to discover that John Cage may have been in the audience. These stories about the collapse of perceived distance (physical or cultural) add another dimension to his long-running series Exquisite Corpse: The Complete Paintings of Manet, 1988–, in which the artist produces brushy monochromatic analogues of each work in Manet’s catalogue raisonné. Monochrome painting was once seen as a transcendent conclusion to the progression of modern aesthetics. But within the exhibition’s matrix of personal biography, the 45-degree (right-handed?) back-and-forth strokes of Prina’s abstract ink-wash drawings are notably grounded in the ineffable complexity of context while offering deadpan matter-of-factness to the supposedly subjective gesture.